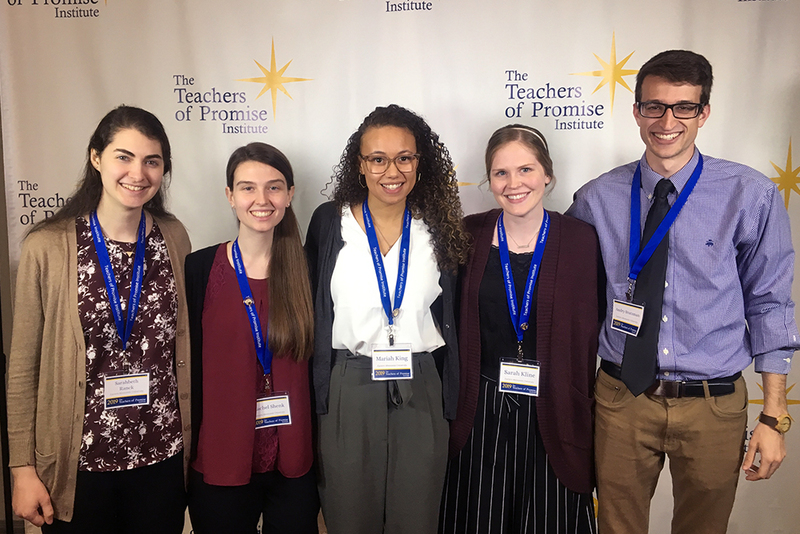 Five education students from Eastern Mennonite University (EMU) were selected to attend the March 29-30 Teachers of Promise Foundation Institute in Richmond, Virginia. The annual event brings together 100 outstanding pre-service teachers from Virginia for recognition, mentorship and professional development. Andry Stutzman, a December 2018 graduate with licensure in music education, vocal/choral, PreK-12, from Harrisonburg, Va.
EMU’s education program values experiential learning, offering early practicum experiences that help candidates determine their professional path. Teacher candidates choose from 15 different licensure programs. The education program is one among five private colleges in Virginia accredited by the National Council for Accreditation of Teacher Education. In 2018, two of EMU’s former Teachers of Promise teaching in Harrisonburg City Schools were recognized by their students for their professional excellence. Wow! What a great group of educators! Proud of each of you for your hard work and caring presence. I’m excited to see where God guides you in your teaching and leading. This is amazing! Way to go to every single one of you, for working hard, staying committed, and choosing to guide future generations. This is so awesome. Wish you the best!